Since 1978, D.H. has been playing in the San Francisco and Los Angeles music scenes. Unlike many other musicians hacking it out today on their prepackaged fax punk rock pretty boy good looks, D.H. Peligro can say he was there "back in the day," contributing to the early days of punk, thrash, anti-full metal jackoffisms and general disease music. As the former drummer of DEAD KENNEDYS, RED HOT CHILI PEPPERS and S.S.I., D.H.'s diversity as a musician enables him to play anything from full-on punk rock to funked up, groove-oriented raucous jams. 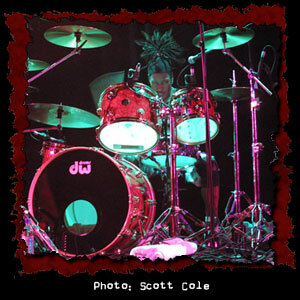 Recently he played drums during a European tour with NAILBOMB (featuring members of SEPULTURA, FUDGE TUNNEL, FRONT-LINE ASSEMBLY and NEUROSIS). D.H.'s forte is drums, but he has fronted bands such as REVEREND JONES AND THE COOL AID CHOIR, AL SHARPTON'S HAIR and THE HELLIONS. In D.H.'s new band, PELIGRO, he sings and plays guitar. Peligro is a new breed of hard-core punk, thrash band to emerge out of the slimy dreck that is Los Angeles. "Peligro" is also the name of the self-titled collective release that comes straight from the heart and mind of D.H. He says the record "reaches light speed while maintaining the groove. In a world beyond the vermin of man or machine, Peligro stays true to the funk, but most importantly, true to the chunk!" The band has a second CD called "Welcome to America," on Muck Records.